EFBK Electr Flight Bag K - innovints Webseite! Especially designed for flight Crews using tablet computers for navigaton, flight analysis etc. in the cockpit. Equipment readily available by just open the aluminum kit. Helps to protect crewmembers, passengers and the aircraft. 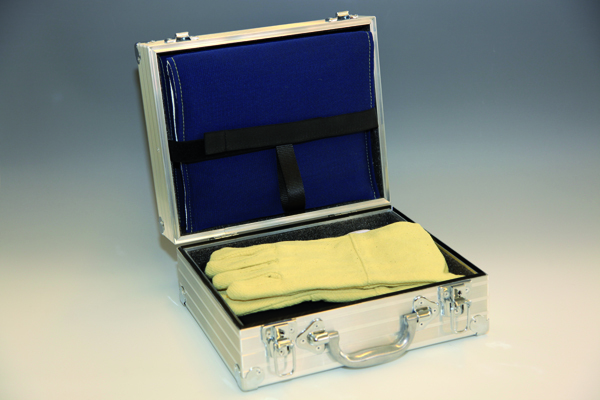 Portable all-in-one solution to handle incidents with thermal runaways safely. Two fire-proof bags each with temperature resistance of up to 1.000°C. Fire-proof gloves and safety goggles. World Power Adapter (two USB ports, 2100mA shared). 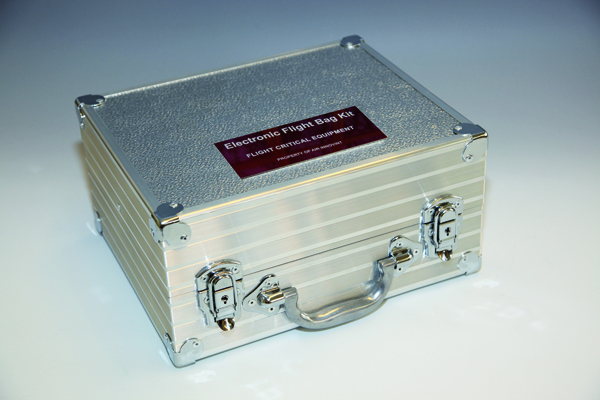 The Electronic Flight Bag Kit is a professional all-in-one solution to manage incidents caused by thermal runaways of lithium-ion batteries used in Portable Electronic Devices (PED) throughout the aircraft. Two PED Containment Bags made of state-ofthe-art fire resistant materials, fire-proof gloves and safety goggles are included to contain damaged devices until controlled cool-down. If tablet computers are used for flight operations two appropriate storage provisions and the possibility to lock the kit are provided. Therefore an adequate protection of flight critical equipment is ensured. By the compact buildup with only one part to carry a straightforward handover during flight crew change is assured without risk of losing items. The additional world power adapter allows charging of electronic devices around the world.